An editorial originally published in the NWTA Courier, Summer 2015 Edition, page 7. Reprinted with permission. It’s no secret—participation at events this year has been down. The year is still young, so it’s still possible that this isn’t a general trend and we’ll see increased numbers in the fall. Still, seeing low turnout at Vincennes, and very small numbers at both Rebels and Redcoats and Klash on the Kankakee, I had to wonder. What has changed between now and a time, perhaps fifteen years ago, when the NWTA enjoyed a larger membership base and increased event participation? Many thoughtful explanations have been suggested—our time period just isn’t “en vogue” anymore, the costs are too high with the poor economy, families’ schedules are more demanding. I think we missed a major reason: http://www.weather.com. Seriously. Even ten or fifteen years ago, while we could tune in for a weather forecast in our area, it didn’t necessarily tell us what the outlook was for the event site. Today, how many of us pop onto weather.com or our favorite alternative to look up what the weather will be like for the location of next weekend’s event? And let’s not even get started on the smartphone—our weather forecasts now live in our pockets. Further—how many of us make a decision on whether or not to go based on that forecast? It can be insidious. We were planning on going to an event, we check the forecast, but the weather looks iffy…so we call a friend in our unit…who now also has doubts…soon it spreads. Now half the unit isn’t going because weather.com called for a 60% chance of rain on Saturday. When I saw that one of the top three reasons for skipping an event (excluding distance and schedule issues) on the membership survey we conducted a couple years ago was “Bad Weather,” I winced. We don’t tend to make most weather-based decisions until close to the event—which means that events that members intended to participate in and budgeted for are getting dropped at the last minute. Though some weather-based choices, particularly ones related to personal health, might be long-range (“I don’t attend summer events because I can’t handle the heat” or “With the new baby, the really cold events are out”) most are last-minute—when we can see if the temps are expected to crest 90 or if there’s rain in the forecast. Sometimes it can make sense to adjust our plans based on the weather forecast. Even if you intend to go no matter what, it’s helpful to see if you should pack the sun hat or the mud shoes. I often adjust my cooking plans based on whether or not the heat will make me want to skip hovering over a fire or rain will make a fire pit difficult to work with. However, scrapping a whole weekend is usually an overreaction. First—remember that even a strong chance of rain doesn’t mean it will rain all weekend. A 50% chance of rain doesn’t mean it will rain 50% of the time, but that there is a 50% chance that any point in the entire area for which the forecast was made is expected to see rain (the National Weather Service definition). Second, consider the accuracy of long-range forecast. One study, considering the statistics of weather-reporting accuracy, determined that, excluding days with no chance of rain, forecasters were correct less than 50% of the time even two days out. The longer-range the forecast, the worse the predictions’ accuracy became—to under 20% correct seven days out. (http://www.freakonomics.com/2008/04/21/how-valid-are-tv-weather-forecasts/) And remember—pair this with the definition of “chance of rain” and you see that even a “correct” forecast might not mean rain for the area that you are in. We certainly saw this at Klash this year—weather reports promised thunderstorms throughout the night Saturday and all day Sunday. From the report, this looked like constant rain. In reality? There were pop-up storms around the region, but we had some rain Saturday night and a gorgeous, clear day Sunday. And third—how big of weenies are we, anyway? Yes, sometimes weather can be miserable. Yes, I think we’ve all attended an event only to sit in a mud puddle or broil under 105 degree heat and resolved “never again.” Yes, there are health considerations to be taken into account. But the majority of the time, the “bad” weather predicted for an event is nothing more than a slightly uncomfortable high daytime temperature or a single thunderstorm. In some ways, “bad” weather at events is a lot like exercising on a day you don’t feel like it—I promise that 90% of the times that you decide to go anyway, you’ll be glad you did. One of my favorite event memories is from a Battle on the Ridge a few years ago that was a near-total rain-out—but all I remember is the fun I had with my unit playing cards, talking, and laughing under the unit fly. So—a challenge. Barring extreme or dangerous weather (and only you know what’s dangerous for you), skip the last-minute decisions this season. You’ll be surprised how often that “awful” forecast turns out to be a major exaggeration. And at the worst? You’ll be a bit damp and take home wet canvas. Given the accuracy of predictions—you might have been doing that anyway. Rowenna Hamper is editor of the NWTA Courier, unit commander of The Continental Marines, and author of Hyaline Prosaic: Living and Stitching History. 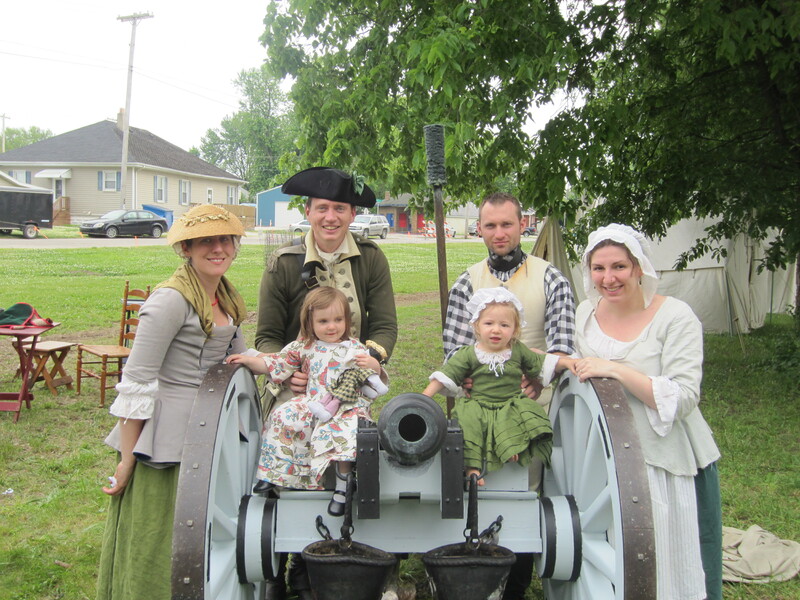 Vincennes 2014: Rowenna, her husband, Thomas, Me (8 months pregnant with Jack), our God-daughter, and Ginny…oh, and Milton (the canon). It was warm, sure, but if we never reenacted in the heat, we would never reenact.